Join the discussion on our forums! 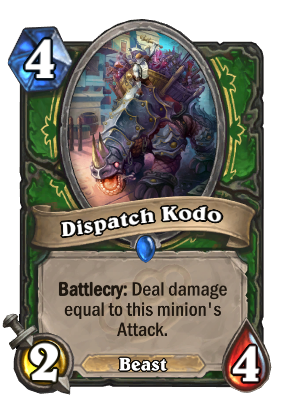 Come discuss Dispatch Kodo over in our dedicated Dispatch Kodo discussion topic. Never seen in play, but after DK Rexxar release, Dispatch Kodo has made a fantastic career. new goal: play control hunter in wild; run 4 minions: 2 dispatch kodo's, emperor and brann; try to get 30+ damage combo with brann and kodos. Yep, it sure does! I found that out the hard way, (missed 1 dmg because I assumed it wouldn't work that way). Another hunter OP card. So hunters vs priests meta? Definitely needs a nerf before it hits the actual game, either dmg wise or cost wise. You're crying over milk that isn't spilled yet. Wait to see the meta before crying OP. This is a 4 mana card that needs other cards played ahead of it to be worthwhile. It does combo well with the goons it is a part of; however, Paladin is the one with buff all the cards in your hand. This will rely on cards specifically buffing it for it to be good (and most of those buffs are buff a random minion in your hand). Not nearly as strong/powerful as Call of the Wild was that truly needed a nerf. But I would bet that some more smorcing will go on with this card (either that or really valuable trading). So this is basically pre-nerf Keeper of the Grove, but without the mana crystal option. It also has synergy with Leokk and other cards that boost damage for minions. So overall it seems like a great tempo play, but not broken. I would rate it 8/10 for constructed and 9/10 for arena. 1. Keeper of the Grove doesn't have a "mana crystal option" it has a silence. 2. The Battlecry takes place before board buffs. So there is no synergie with Leokk. Sorry I don't play druid and for some reason I remembered a mana crystal rather than silence. So I think Dispatch Kodo's battlecry should get buffed by Leokk too. Actually, the Battlecry damage does receive a boost from Leokk and Timber Wolf, (presumably Dire Wolf, Raid Leader, and Stormwind Champ as well). I didn't think it would either, so it caught me by surprise. Dispatch Kodo is a great card, even unbuffed, just to fight for and keep the board in the midgame. This is basically a Flametongue Kavu from Magic (for the old time sake). Very strong card, potentially could be even stronger with hand buffs.